An overhead image of St. James Cathedral as the Mass of the Resurrection begins. Archbishop Murphy’s brother Bart Murphy, sister Eileen Frey and their respective families are seated in the top left portion of this image. 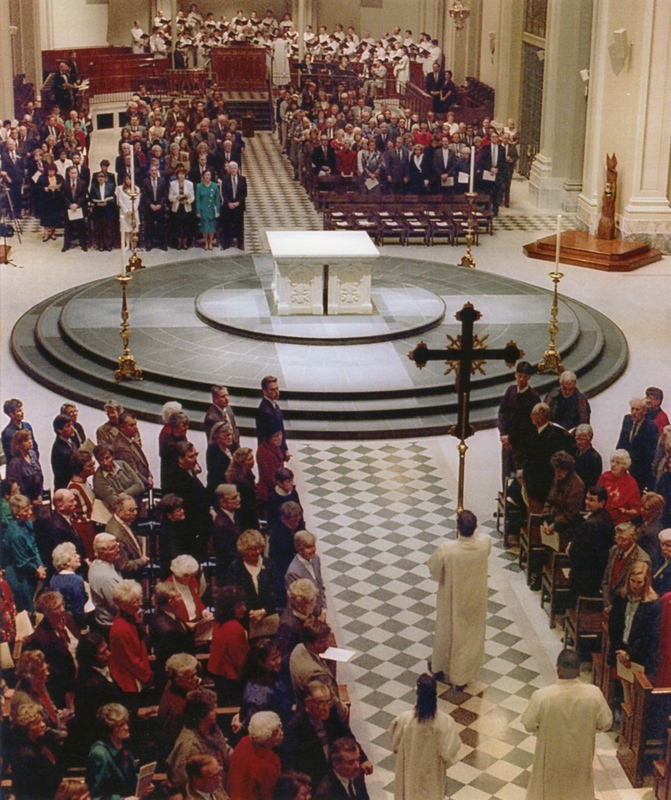 The Mass of the Resurrection took place in St. James Cathedral on July 3, 1997. It was a beautiful ceremony and a fitting way to commemorate the life and ministry of Archbishop Murphy. Bishop William S. Skylstad of Spokane, WA was the principal celebrant. Four archbishops, 25 bishops and more than 150 priests from the Archdiocese of Seattle and points across the United States concelebrated the Mass. The Very Reverend George Thomas, Vicar General of the Archdiocese of Seattle, gave a heartfelt and inspiring eulogy. More than 2,000 people attended the Mass. A number of elected officials including Gov. Gary Locke, Senator Patty Murray, Seattle Mayor Norm Rice and many members of Congress were also present. Click here to read the full text of “Steward of the Mysteries of God” – the homily/eulogy delivered by the Very Rev. George L. Thomas, Vicar General of the Archdiocese of Seattle. Click here to view a video of the Very Reverend George L. Thomas’ concluding remarks of his homily/eulogy at Mass of the Resurrection for Archbishop Murphy. Click here to view a video of the Most Reverend William S. Skylstad, Bishop of Spokane, WA, offer some closing thoughts at the Mass of the Resurrection for Archbishop Murphy.